Acomet-chasing European space probe has a blind date with an asteroid onSaturday, and will snap the first ever close-up photos of the space rock in alandmark flyby. TheEuropean Space Agency's Rosetta spacecraft is currently on a path to its maintarget, comet 67P/Churyumov-Gerasimenko. It is expected to arrive at the cometin 2014. But, on July 10, the probe will swoop past a different cosmic object ?the asteroid Lutetia. OnSaturday, Rosetta is expected to fly by Lutetia at a distance of about 1,900miles (about 3,100 km) at a relative speed of 9 miles per second (15 km/s). Theencounter is expected to occur at approximately 3:45 p.m. GMT (11:45 a.m. EDT). 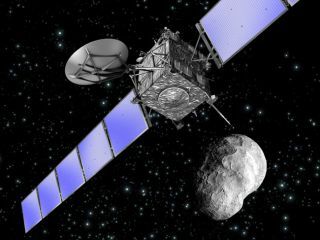 Theclose pass will allow Rosetta about two hours of observation time to study theasteroid. Rosetta will rapidly beam this data to Earth, and the firstpictures from the quick visit are expected to be released later that evening. "Littleis known about asteroid Lutetia other than it is about 100 kilometers (62miles) wide," said Claudia Alexander, project scientist for the U.S. rolein the Rosetta mission, from NASA's Jet Propulsion Laboratory in Pasadena,Calif. "Allowing Rosetta's suite of science instruments to focus onthis target of opportunity should greatly expand our knowledge of this hugespace rock, while at the same time giving the mission's science instruments areal out-of-this-world workout." Theenigmatic space rock, which is from the main asteroid belt that orbits betweenMars and Jupiter, simply appears as little more than a single point of light toground-based telescopes. Preliminaryobservations suggest that Lutetia's continuous variation in brightness indicatethat it is rotating and has an uneven surface. These observations have allowedastronomers to estimate the asteroid's shape and size, but their determinationsare still varied. Rosettacould provide more conclusive evidence about the asteroid's dimensions andcomposition ? another area with more questions than answers. Afterencountering Lutetia, Rosetta will not perform scientific activities until itreaches Churyumov-Gerasimenko in May 2014. Once there, it will observe thecomet for 18 months, releasing a lander to further explore the comet inNovember of that year. Rosettapreviously flew by a different asteroid, called Steins, on Sept. 5, 2008,approaching the space rock to within close to 500 miles (800 km). ButLutetia is a much larger asteroid, which is why the spacecraft will glide pastat a greater distance. Any closer, and the probe would not be able to fit theentire asteroid into the onboard camera's field of view. ESAscientists are hoping that the observations from the Lutetia flyby willcontribute to the relatively small body of knowledgeaboutasteroids. Thedata collected from the Rosetta flyby will provide valuable observations for asteroid science, and will at least give scientists preliminary information that canthen be corroborated through ground-based observations. And, the findings willnot only apply for Lutetia, but for other asteroids as well. Onehundred and fifteen elementary school students will be at JPL during the flyby.The students will view close-up images of Lutetia, talk to the U.S. Rosettaproject manager and participate in educational activities. TheU.S. Rosetta project leaders hope to use this event as a kickoff of morecoordinated activities with selected schools around the United States.